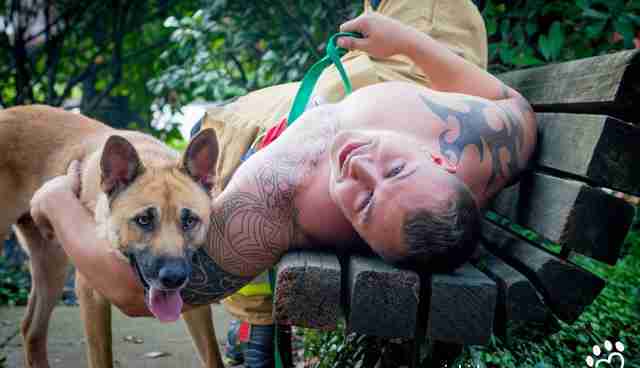 Firemen, police officers and veterans + dogs = best idea ever. After adopting two rescue dogs, named Blue and Birdie, who changed her life forever, Ricki Beason decided she wanted to give back to the rescue community somehow. "I literally couldn't imagine my life without them - they have brought so much love and happiness into my life," Beason told The Dodo. "I wanted other people to experience this kind of love and loyalty that only a rescue dog can provide." As a way of giving back, Beason decided to take up photography. Being a physical therapist, Beason knew very little about the art, but slowly taught herself everything she would need to know in order to give back. She began photographing dogs at rural shelters who wouldn't otherwise get a lot of attention to help them get adopted and bring more attention to those shelters in general. "Creating these pictures and showcasing these beautiful rescue dogs has made a huge impact on their adoption rate," Beason said. "It's hard to say no to a crazy cute pup staring back at you through a picture - if I could I would take them all home." In 2014, Beason decided she wanted to give back even more. She wanted to help raise money for the shelters she photographed - and so she teamed up with a bunch of attractive men. Beason created Heartthrobs and Hound Dogs, a yearly calendar that features men of service posing with adorable rescue dogs. For the first year, the calendar featured firemen, and the second year, it featured military veterans. For the 2017 calendar, military veterans from Dallas, police officers from Austin and firefighters from Houston will all be featured with dogs from six different rescue groups. "I hope with this project I am able to change people's perceptions of rescue dogs and build an admiration for our servicemen who not only keep our cities and country safe, but also volunteer their time to help these rescue dogs," Beason said. "These aren't male models, these aren't actors; these men are real-life heroes." The photoshoots for the calendar give the servicemen a chance to relax and spend time with adorable dogs, and give the dogs a chance to get out of the shelters and spend time with new people in new places. ... and so much fun to look at, for SO many reasons. "Too often we look over the shelter dog because they aren't deemed as 'glamourous' as a breeder dog, but these dogs, if given the chance, are the most beautiful and loving dogs a person could ask for," Beason said. You can check out more of Beason's incredible work on her website.